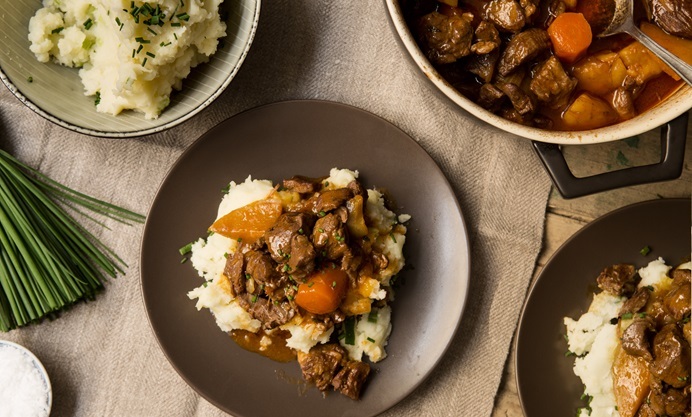 Hayden Groves shares a delicious mutton casserole recipe served with comforting champ potatoes, the perfect slow-cooking dish for the winter months. "Long and Slow" sounds like a title of a book from the top shelf, however this is the best tip I can give you when it comes to dishes that epitomise this time of year. Thoughts turn to comfort foods that are gently simmered, long braised and slowly roasted. These are dishes that are best improved with a secret ingredient that money just can’t buy - time! The addition of the herbal variety is a lot easier to come by. Anyone can be taught to cook a fillet of beef; it’s a question of sourcing a good piece of meat, seasoning it and using a timer until you get the desired cuisson, that’s it! It’s hard to improve this expensive piece of protein, however secondary cuts of meat like shin, cheek or even the shoulders, in the hands of a good technician, can be elevated to a meal far more rewarding and flavoursome. Look for a cut of meat that has seen some action; working muscles are tough but that toughness develops real flavour. Think of beef cheeks, the cow grazing in the field chewing all day long, those two nuggets of meat once slowly braised turn into the most tender, unctuous pieces of meat imaginable. Occasionally I love to slowly roast a shoulder of lamb on the bone for the family. I leave the lamb out of the fridge for an hour so it is easier to make incisions every inch or two apart with a sharp vegetable knife. I insert slivers of garlic and rosemary ‘old school style’ and season generously then put it on a rack over a deep roasting tray. I place this in an oven set to 220°C for 15 minutes then reduce the heat to 140°C and slowly roast. After 90 minutes I remove the shoulder from the oven, baste and reserve on the stove top briefly whilst I slice some peeled Maris piper potatoes. These are then layered in the lamb roasting tray, some chicken stock poured over the top and brushed with some butter. I then place the lamb on the rack back over the potatoes to catch the juices then into the oven again. After a long 2 hour family walk we return home to a lovely aroma coming from the kitchen. The lamb is moist, flavourful yet tender and falls apart with the minimum of effort and those potatoes are golden on top and all the better having absorbed those tasty lamb juices. 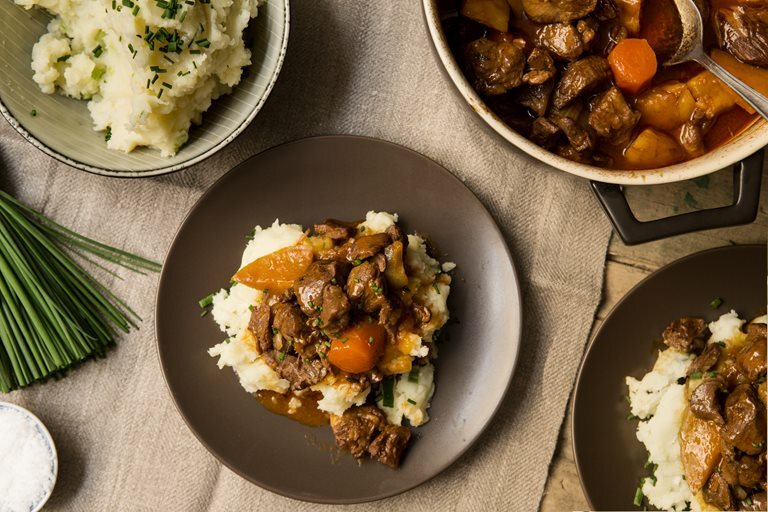 Another favourite is beef shin; large chunks are browned off in a pan then braised in the oven slowly for several hours with red wine, garlic, herbs and vegetables, served with a side of creamy horseradish and tarragon mash, what’s not to like, its comfort food at its best. Whenever you are slow-cooking, think about the size of the vegetables. If you want to use them as part of the finished dish they need to play a dual role; impart their flavour, however still maintain some of their structural integrity for the finished dish. To ensure this, you need to either chop them larger or add them half way through the cooking process. The herbs you use are important as well; hardy ones such as thyme and rosemary should be introduced early and tied with a piece of string so you are not playing hide and seek with the woody bits later. Soft herbs, such as tarragon, parsley and chives need to maintain their colour, vibrancy and freshness so these are added in the last couple of minutes just before serving. When slow-cooking, use a pan with a lid or a layer of tin foil so the braise retains its moisture. Once the meat is tender ensure the resulting sauce is the right consistency, add a splash of stock or water if too thick. If the opposite applies and the sauce is watery and weak, remove the meat and vegetables with a slotted spoon, so they don’t overcook, boil rapidly to reduce and intensify the sauce. You could also add a teaspoon of cornflour to add a touch more body, then add back the meat and vegetables. For the seasoning, maybe a little splash of acid in the form of red wine vinegar to heighten the flavour and finally add some fresh chopped herbs. A classic braise can be made a day or two before and chilled in the fridge where the flavour will develop. Remove any fat that has solidified on top and then reheat carefully. Go on, give you and your guests a treat with something long and slow this winter.